100 years ago, Milton Hershey, the founder of the Hershey Company, and his wife Kitty were unable to have children of their own. Milton and Kitty took their wealth and created a home and school for orphaned boys in 1909. After his wife died, Milton Hershey gave his entire fortune to the School. Mr. Hershey has been quoted as having said, “The School was Kitty’s idea. If we had helped a hundred children it would have all been worthwhile.” One hundred years later, Milton and Kitty Hershey’s legacy lives on and has educated thousands of students. More information about Milton and Kitty’s story and the Milton Hershey School can be found here: www.thehersheylegacy.com. 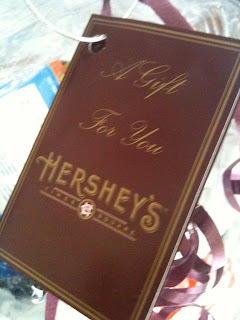 Hershey's and me are going to give one of you a GIFT BASKET FILLED with HERSHEY's goodies and treats right to your door! Milton Hershey and his wife demonstrated huge amounts of love and have changed people's lives....two things that I hope to do, too! 2. Then comment below the words "LOVE & CHOCOLATE"
Winner will be chosen by random number selection! Entries will be open until, Thursday night at midnight, Pacific Standard Time. WINNER will be chosen on Friday, June 25th, 2010. I love Kandee and I love chocolate!!! LOVE & CHOCOLATE. Wow, i'm the first entry. I LOVE chocolate too. MMM, it makes me happy. Love you too kandee. I hope I win!!!!!! I love Hershey and all the family stood for. I've known many people who have gone to the school and it has dramatically changed their lives! LOVE AND CHOCOLATE! xoxox- Cait! <3 u kandee! YEY! Live in the US! LOVE& CHOCOLATE Best things ever!!!! love you kandee! your the best! LOVEEEE and CHOCOOLATE more more !! ahhhh i wish i lived in the US now :( I really hope that you will have a contest soon where i can join. I live all the way in Norway. Thank you for this giveaway it is so awesome! I love Hersheys Chocolate!! "LOVE AND CHOCOLATE"....again. Posted on my Facebook page too. Honestly not sure how to link it all up. Sweet Story! I Absoltely love Hershey's Chocolate!!!!!! "LOVE & CHOCOLATE"
Love and chocolate!! What an awesome story! I just shared your link on my facebook page. thanks so much for this fun giveaway kandee and hershey! oops I mean love & chocolate! Love and chocolate... They go hand in hand! You should really visit Hershey PA! It's one of the most wonderful places one earth! You can just feel the love :) Milton was a true hero! I love LOVE & CHOCOLATE! My grandma's maiden name is Hershey and her great great uncle was Milton. :) Does that qualify me or disqualify me?? It's always neat to see how Hershey touches people's lives. LOVE & CHOCOLATE Thank you! !